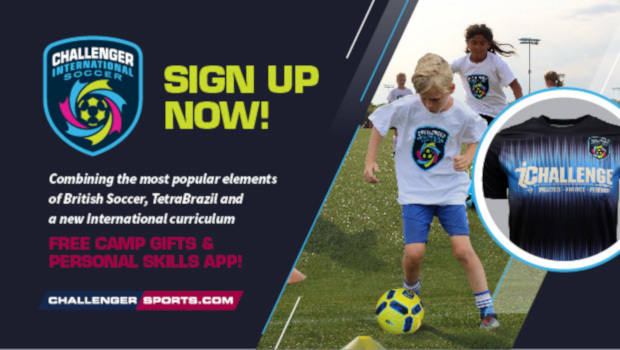 Challenger Sports, the leading camp company in the US has launched a brand new, soccer camp that combines the most popular elements of their two camp programs, British Soccer and TetraBrazil. The all new Challenger International Soccer Camp will offer instructional camp programs for each age/ability level! The TinyTykes program will provide 3-5 year olds with fundamental soccer activities, games, and stories, designed to enhance technical skills along with physical and social development. The Half Day Camp for 6-16 year olds is the most popular program and will provide 3 hours of skill development, games, challenges, and competition each day. Register now for Challenger's International Soccer camp and get a free international ball, t-shirt, poster, skills evaluation and new downloadable coaching app & 20 skills videos! Register 30 days before camp and qualify for a free International Game Jersey!